George W. Bush doesn't flaunt his hard-won war medals. Occasionally he will wear them if he is attending a formal or military event, but for the most part, they are tucked away in his trophy cabinet. Due to a large number of requests for information about his wartime heroism, I began studying his medals. What I found surprised me, and I felt it was my duty as an American to spread these remarkable findings. I, like most people, figured that George W. Bush's American Star Medal was won for valor in the face of tremendous challenges. I had never heard of one before, so I just figured they were very rare. When I took a closer look, I realized that the "medal" is actually an American fifty-cent coin pressed into a crinkled-up wad of gold foil. The foil appears to be from Rolo chocolate-covered caramels. The yellow star backing appears to have been made from the plastic top of a Planter's Mixed Nuts Can. 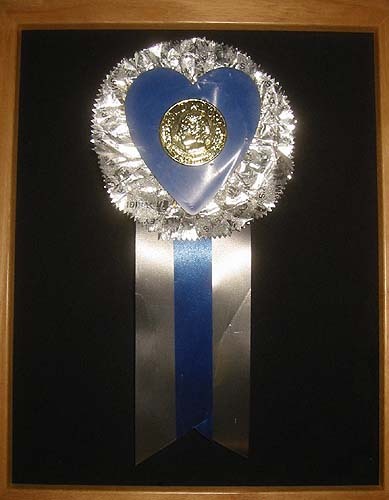 I don't remember when I first heard about George W. Bush's Silver Superstar medal, but I knew it would be hard to get with such an awesome name. I automatically assumed that this medal was only awarded to brave men that took immediate action, charging into danger, just like the superheros in comic books. Closer examination revealed that this may have been incorrect. 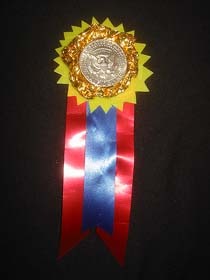 This medal seems to be topped by overlapping plastic badges. The top badge reads "Deputy Sheriff". The white ribbon seems to be a standard white third-place ribbon for a child's contest. 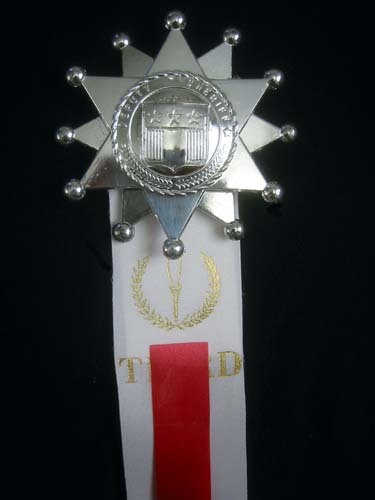 Note the "T" and "D" on the sides. 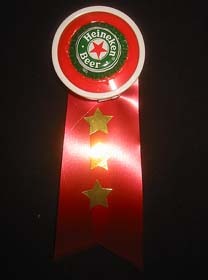 The red ribbon is probably obscuring "HIR". Everyone knows that George W. Bush has an Olympic Medal. I never really considered if it was gold or not, or even what sport he won it for. I guess I just figured it was for golf. When I finally got a look up close, I found out the truth. 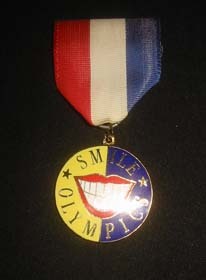 It is a medal for the Smile Olympics. That is still pretty cool. When I was a scout, the scoutmasters would often thrill us with tales of courage. They sometimes ended these stories with a man being awarded a leadership medal. I thought George W. Bush's Leadership Star medal had been awarded by Congress when he was a young Navy Seal, but when I took a closer look, I realized that it was actually roll of plumber's tape, decorated with a bottlecap. It has a red ribbon and gold star stickers. I don't think Congress awards medals made out of bottlecaps. 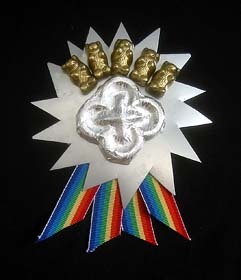 I hadn't heard of G.W's Five Bears of Friendship Medal, but when I saw it, I was struck by the intricately carved bears at the top. Closer examination revealed that they are actually gummi bears that have been spray-painted gold. The Purple Heart is awarded to soldiers that are injured by an instrument of war in the hands of the enemy. I thought that Bush had a Purple Heart, but when I did a little research, it turned out to be a Purple Lion's Heart medal instead. I didn't know what these are awarded for. I figured they were probably for being wounded by an enemy attack lion or for having a lot of heart in battle. This, too, turned out to be incorrect. George Bush's Purple Lion's Heart medal has silver foil from sticks of Juicy Fruit gum, and the heart, which, by the way, is more like blue than purple, is plastic, of a type sold with helium balloons. When I heard that George Bush had a medal called the "Congressional Bell", I figured that he had probably won the medal by sounding the alarm, like Paul Revere. 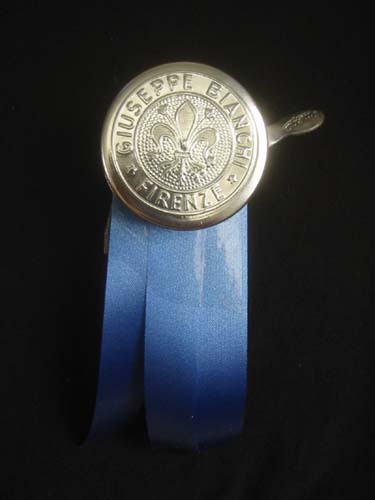 Upon closer examination, I realized that this "medal" was actually a Bianchi bicycle bell, with some blue ribbons attached. It is well known that George Bush is one of the only people in America with a fearless ninja medal. This is the highest honor bestowed upon foreign nationals from the Japanese government, and it is usually awarded in utter secrecy. I assumed that George Bush was awarded this medal when he saved the life of a Japanese emperor fighting behind enemy lines in Eastern Russia. 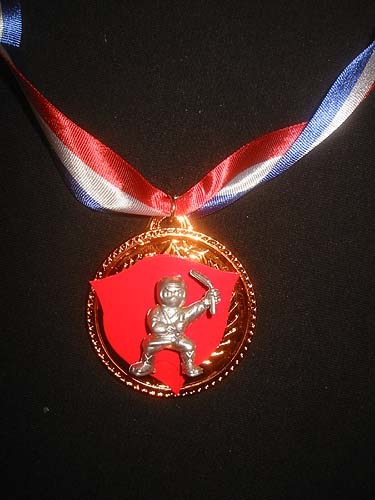 Upon closer examination, it became very quickly apparent that the Fearless Ninja Medal is assembled using hot glue on a makeshift plastic medallion. The Japanese need a little help with their medals. This one has a cool name, but it is totally crappy when you get a close look at it.